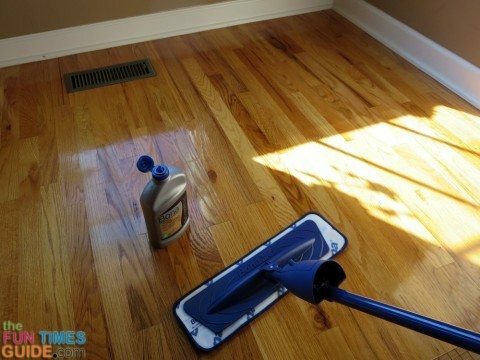 Using Bona Refresher As A Floor Polish Instead Of Using Floor Wax: How To Make Hardwood Floors Shine Without Damaging Them! This post is in response to all the readers who keep asking what I think of using Bona Refresher as a wood floor polish — since I initially mentioned it here. I’ve known for a couple of years that I wanted to use the Bona Refresher to add life to my dulled hardwood floors. I finally used the Bona Refresher for the first time and I want to let everyone know how it went — and what you can expect if you use it to add shine to your hardwood floors. For starters, I wish I hadn’t put it off for so long, because my floors now look wonderful. And it was so easy! But there are a few things I learned that I’ll be doing differently the next time I use it. Make sure you don’t buy (or haven’t previously used) Bona Polish on your hardwood floors. It’s a good product in and of itself, but it just can’t be used on floors that you’re eventually going to use the Bona Refresher on. Bona Polish contains polyurethane and acrylic. Bona Refresher contains polyurethane and water. Once you use the Bona Polish, you must have your floor professionally stripped and shined in the future, rather than using other products to bring life back to those floors once they become dull again. Once you use the Bona Refresher, you can use anything you like to continue to add shine to your hardwood floors from that point forward. #1 – Bona Refresher adds temporary new life to your hardwood floors. It wears off slowly and gradually after 3-4 months. For that reason, it can safely be used 3-4 times a year to keep restoring shine to your aging hardwood floors. Personally, I like the fact that Bona Refresher doesn’t have a permanent effect. This was especially comforting the first time I used it — not knowing what to expect, how dramatic the effects would be, and if you could see where I started and stopped or not. As a DIYer, it’s also nice to know that you always have this option available to you — and that it’s so affordable. #2 – It really does dry in just 1 hour! I waited an extra 15-20 minutes, just to be sure. But the floors were perfectly dry to step on with bare feet — no stickiness whatsoever. I also re-applied Bona Refresher in each of the 3 high traffic areas I used it on. I waited an hour and a half before re-applying, and it worked great. The shine was a little bit more noticeable than with one coat alone. Tip: I turned on all of my ceiling fans, in an effort to help speed up the drying time. #3 – My biggest dilemma was how I was going to keep my 100-lb indoor dog off the floors while I was cleaning them, and then while they dried. I used a freestanding baby gate to keep my dog in the master bedroom (a place he’s already comfortable spending long hours with us anyway) while I worked on the floors. He could see and hear me, so he wasn’t too rebellious. For my dog’s sake, I put the rugs back down after about 4 hours of dry time. Had the inside of our house been more humid, I would have probably waited longer. For the record, they officially recommend waiting a full 24 hours. #4 – My best advice is to clean your floors (and baseboards) thoroughly before using the Bona Refresher. My pre-cleaning process consisted of using the Swiffer Sweeper first, then the Bona Spray Mop. Having a big dog (who sheds a lot!) means there are fine hairs floating in every corner and all along the baseboards. That, combined with hardened dog drool in a couple of key areas of the hardwood flooring where my dog hangs out, means I should have given twice the effort that I normally use to clean my hardwood floors. I didn’t. And I kinda regret it. The results weren’t devastating or anything. But you can definitely see some of the dog drool spots that I missed during the pre-cleaning phase. (Truthfully, I knew they were there, but I thought the Refresher — being a liquid — would help to magically make them disappear. It didn’t. It actually set them in.) Also, as I was spreading the Refresher on, I noticed a few dog hairs got trapped in the liquid Refresher. Oh well. Live and learn. The Refresher will wear off naturally after 3-4 months, and I can do it right the next time! By the way, this is one of the few times that I would recommend using the Bona Motion Mop instead of the regular Bona Spray Mop. It’s not really worth buying the motion mop just for everyday hardwood floor cleaning, but for deep cleaning hardwood floors a few times each year, it is worth it! I’ll be using mine for this purpose in the future. #5 – The instructions say to use a special applicator pad when applying the Bona Refresher. I didn’t. Instead of using the Bona applicator pad, just used the regular Bona microfiber pad that I use with my Bona Spray Mop — a fresh and clean one. I’ve read about people using all sorts of things to apply the Refresher — all with good results — so I really don’t think it matters what you use to apply it with. Just make sure that your applicator pad is CLEAN. By the way, since the Refresher product is water-based, the microfiber pad a cinch to clean afterward. Just toss it into the washing machine with your other towels. #6 – I didn’t use the Refresher on every inch of my hardwood floors (like you’re supposed to). I only did the high traffic areas. I like how you can use it to add shine only to the areas where you need it. But next time, I would do a better job of getting right up to the edges with the Refresher — like up close to the 2 large floor rugs that I didn’t move (maybe even a little bit under their edges) and up close to the baseboards — because those are all parts of the entire area I was cleaning and the floors still look dull along those few edges. If (like me) you don’t want to make a major event of this by pre-cleaning and shining your entire first floor, you can feel comfortable using the Refresher to spot-shine your high traffic areas only. Tip: After completely spreading the Refresher to my satisfaction in that area, I always made one final pass with the same microfiber mop pad, extending my reach slightly beyond the high traffic area. That way, the Refresher is ever-so-slightly wiped into the non-shined areas. #7 – The results are great, but they’re not overly dramatic. 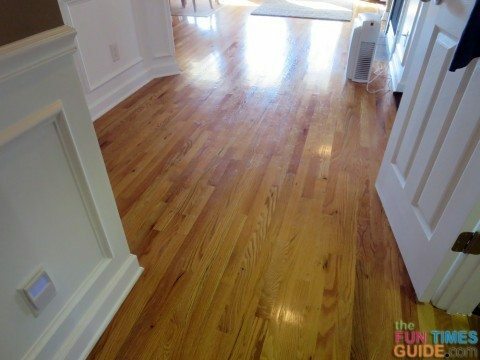 The Bona Refresher added just enough shine and polish to my hardwood floors. Don’t get me wrong, they don’t look brand spanking new or anything. That’s because the gloss itself is not super-shiny, and also because you can still see some of the dog drool that I didn’t clean effectively beforehand. How much product did I use? Overall, I’m quite happy and look forward to using Bona Refresher again (and again). I highly recommend it. #8 – Wondering why I chose Bona Refresher over other hardwood floor polishes? I’ve trusted Bona hardwood floor cleaning products ever since we messed up the hardwood floors in the first home that hubby and I built together 13 years ago. Back then (before we knew better), we used things like PineSol and Mop & Glo to clean those floors. (Eeek!) Needless to say, we pretty much ruined those hardwood floors. And we went through a lot of hassle to “fix” the floors and get them back to a presentable condition prior to selling that home. I’ve used Bona hardwood floor products since day one, and I’ve been really happy with both their hardwood floor cleaner and their spray mop. And now I’m thrilled with their Refresher as well for polishing my hardwood floors. By the way, after using the Bona hardwood floor cleaner on my floors for the past 5 years, I can honestly say that my hardwood floors still look great. The cleaning solution has not harmed the floors in any way. 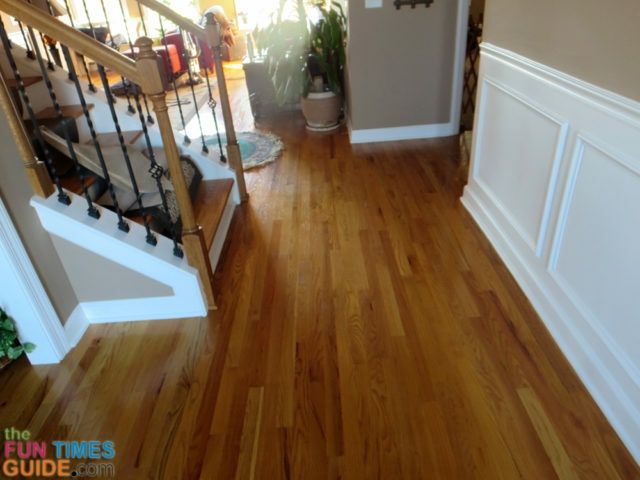 They pretty much still look like new, and we still get compliments on the beauty of our hardwood flooring. So why did I need the Refresher then? Because there were 3 key areas (mentioned above) that simply needed a boost. High traffic dulls a shine, no matter what you use to clean & protect your floors. The Bona Refresher is exactly what I needed — just for those areas. I haven’t covered everything there is to know about using the Bona Refresher — just a few of the more unique things I learned along the way. The instructions on the bottle itself are pretty straightforward, so be sure to follow their advice for the best results. Personally, I also got a lot of reassurance after reading the feedback from others who’ve used the Bona Refresher on their hardwood floors. — like why you should gently rock the bottle to mix the ingredients rather than shaking it (which will cause air bubbles to pool up on your floor). 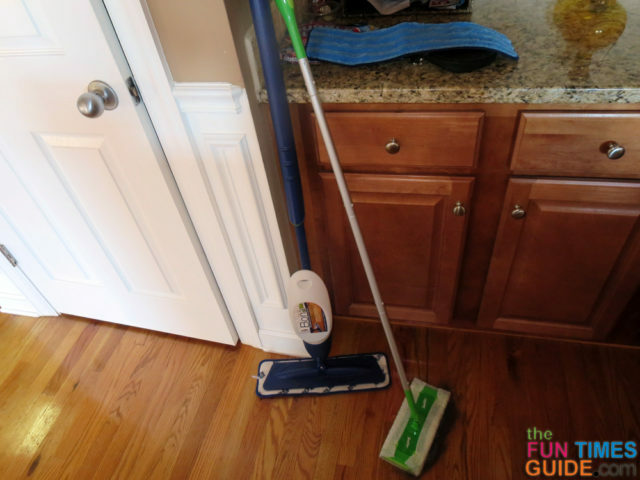 Bona Spray Mop vs Shark Steam Mop: Which Is Best For Hardwood Floors? Bona Motion Mop Review: Is It Better Than The Regular Bona Spray Mop?